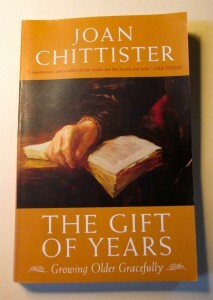 And this book is the gift I would gladly give, if I could, to everyone I know who is apprehensive about aging. Of all the books on the subject of purposeful aging I’ve read in recent years (on the run-up to my own 70th birthday next year), this is the book I keep closest – on my bedside table – and return to most often. Chittister, now 78, a Benedictine nun, well-known author of dozens of books, and a popular lecturer, was voted the most inspirational woman alive in a recent survey. Reading this one book alone, I can see why. I know I’ve mentioned Chittister’s book before (see June 30, 2014, post, “A Bright and Vibrant Place”), but I’d like to focus solely on it now, in the hope of nudging WOW Factor readers to find it, read it and benefit from it, as I have done. Looking back, I see that at every significant new stage of life I’ve turned to trustworthy books for needed guidance and direction. This book, at this stage, I’ve found, is such a guide. Reading The Gift of Years is empowering. It is also enlightening in every sense of the word: It lessens the weight of aging anxieties, it sheds light on the shaded path ahead, it lifts and brightens our spirits. Joan Chittister is a truth-teller, and this book is a gift.